Recently, we have seen more news reports about homeowners who are changing the look of their landscapes, in some cases foregoing a lawn altogether. City officials pressed charges against a homeowner in Oak Park, Michigan for growing a vegetable garden in her front yard. She faced possible jail time. The charges were eventually dropped but not before the story received international attention and generated considerable debate on both sides of the issue. Since then, similar stories have reached the media. Controversy about what should or should not constitute a front yard is an issue that will continue to strike nerves. America’s love affair with the ubiquitous green lawn is a powerful thing. Unfortunately, we can no longer live in denial of the toll a lawn’s insatiable thirst takes on our precious water supplies. Benjamin Franklin wrote, “When the well is dry, we know the worth of water.” Yet, we tell our rice farmers they cannot have the water they need because we just cannot tolerate a brown lawn. There are those who will never look at a lush bed of tomatoes growing in a front yard and give it their blessing. Indeed, many city landscape ordinances and Homeowners Association deed restrictions would not allow it. However, we can certainly all work to find some middle ground, so to speak. And we don’t have to wait until the “well is dry”. Reducing the size of the lawn is a great start. 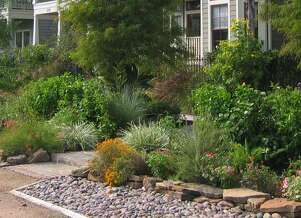 Creating a more “natural” landscape is even better: a space that highlights more native plants and which can accommodate some fruits and vegetables nestled amongst the Mexican Bush Sage and Black-eyed Susan. Once established, planted areas, especially those with a predominance of native plants, need far less water to maintain their health and beauty. Until outdated laws and deed restrictions begin to change, it is important to understand and follow what is and is not allowed in your neighborhood—be proactive. Because the possibility exists that governing entities can work with you, taking an antagonistic approach from the start is not the best way to win support or approval. There are strategies you can implement that can maximize communication and education while minimizing or eliminating confrontation. Begin with a gradual change, perhaps enlarging the planted areas a few feet each year. In the meantime, communicate with your neighbors to inform them of your plans and keep the dialogue positive. 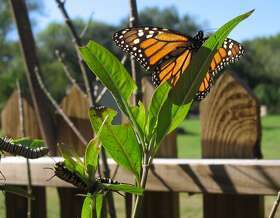 Engage them and their children as you show off the Monarch caterpillars munching on milkweed on their way to becoming butterflies. Create borders or setbacks in front of your native plant areas to reveal a neat and tidy edge. This gives the appearance of order, even if it is ordered chaos. A setback will prevent plant material from hanging over curbs and public sidewalks. Plant in masses for visual impact. Native plants are sometimes not as showy as conventional landscape material so single specimens can get lost in the mix. Grouping them offers eye-catching interest. Choosing a variety of plants found in naturally occurring areas—think plant communities—such as wetlands, prairie, or shaded forests can make it easy to determine growing conditions these plants need. For example, some may require a well-drained area in full sun while others need to have “wet feet” most of the time. As you win more converts to your “natural” landscape, neighbors may want to know the names of plants. We have gotten so far away from being able to recognize native plants that some may view them as exotic. During America’s early years, many European horticulturists became enchanted with many of our native plant species and proceeded to cultivate them in their own, very grand landscapes. Some species all but disappeared from American soil. 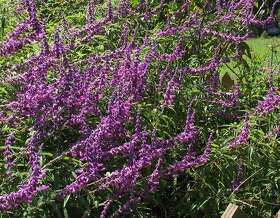 Thus, as gardeners reintroduced them, many viewed them as foreign rather than indigenous plants. Often, this identity problem still exists. To help educate neighbors and perhaps add a sense of prominence to your yard, you may choose to use plant tags to highlight the plants. Above all, practice proper maintenance. Allowing the natural landscape to succumb to a “vacant lot” look will not create a climate of understanding or acceptance. Many may not be ready to face a bounty of glorious vegetables as they walk or drive past a landscape, but until we get to that point, we can certainly create more water- conserving landscapes that beautify communities while they help protect every precious drop of rain that falls. Chris LaChance is WaterSmart Coordinator for the Texas A&M AgriLife Extension Service and Texas Sea Grant. WaterSmart is funded by a grant from Houston Endowment, Inc. Contact Chris at c-lachance@tamu.edu.